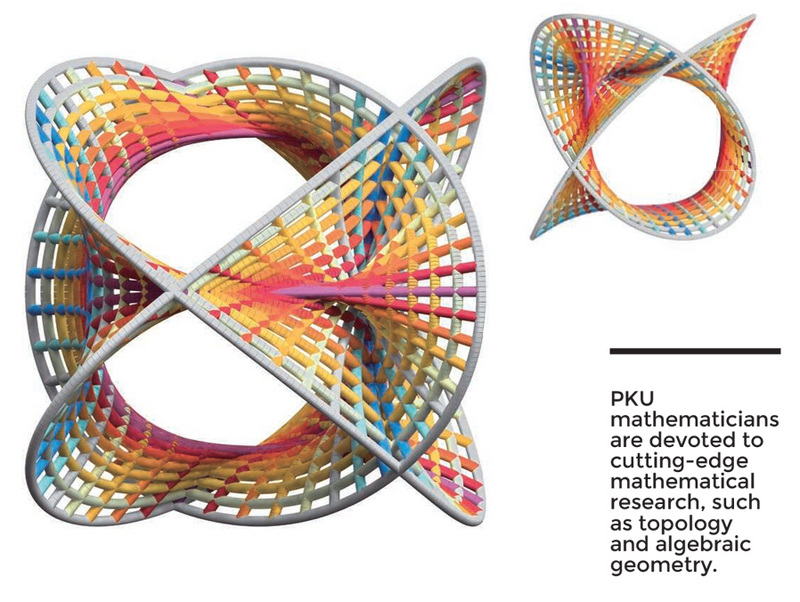 The School of Mathematical Sciences (SMS) at Peking University (PKU) is renowned for its outstanding research in pure and applied mathematics. Its first students joined in 1913, and were among China’s original scholars of modern mathematics. SMS researchers have achieved notable results in geometric analysis, low-dimensional topology, mathematical physics, dynamical systems and computational mathematics, leading to an increasing number of papers in top journals such as Annals of Mathematics. One extraordinary example is work by PKU professor, Fan Huijun, whose sophisticated analysis on the moduli problem of Witten equation — proposed by Edward Witten in 1993 — has led to the quantum singularity theory, now known as the FJRW theory. The work proves Witten’s ADE self-dual mirror symmetry conjecture and the generalized integrable hierarchy conjecture in the D and E cases, greatly extending the famous Witten-Kontsevich theorem. The FJRW theory has now become a hot research topic in mirror symmetry, having been cited by many mathematicians, including Witten himself. SMS’s 99 faculty, including six members of the Chinese Academy of Sciences (CAS), five invited speakers of the International Congress of Mathematicians and three invited speakers of the International Congress on Industrial and Applied Mathematics, train 502 graduate students, 265 for doctoral studies and 237 pursuing master’s degrees. The quality of the faculty’s achievements is also demonstrated in many illustrious awards at home and abroad, such as the Outstanding Young Scholar Award of the Qiu Shi Science and Technologies Foundation, bestowed to Guan Qi’an in 2016. PKU mathematics is now among the top 50 in many international ratings such as QS, ESI and US News. The latest QS World University Rankings by Subject ranked PKU mathematics 30th in the world and first in China. Beijing International Center for Mathematical Research (BICMR) was founded in 2005 at PKU to promote cutting-edge mathematical research and its applications, while enhancing scientific exchange and cooperation between Chinese and international mathematicians. Through a novel recruitment and promotion system, BICMR has gathered talented young researchers from abroad and developed new models of mathematical education. It now has 33 outstanding faculty members, including three CAS members, supported through excellent platforms for scientific exchange. They conduct research on algebra, number theory, algebraic geometry, differential geometry, topology, mathematical physics, as well as applied and interdisciplinary mathematics. Their work appears in many high-quality publications and has been recognized by awards. The centre director, Tian Gang, who jointly proposed the Yau-Tian-Donaldson conjecture, also gave his proof of it, marking a ground breaking work in the field of complex geometry. The proof has integrated multiple theories of mathematics, covering differential geometry, algebraic geometry, partial differential equations and metric geometry, bridging algebraic geometry and differential geometry. Xu Chenyang, a BICMR professor, has made a series of breakthroughs in high-dimensional algebraic geometry. Seeking to understand underlying similarities between solutions of different equations, Xu and colleagues have used a fundamental mathematical idea to solve equations in many dimensions. Using birational geometry techniques, they have narrowed the range of possible solutions. The work was published in top mathematical journals and won Xu the 2016 ICTP Ramanujan Prize and the Future Science Prize in 2017. Another BICMR researcher, Liu Ruochuan, is an expert in arithmetic geometry, which applies ideas and techniques inspired by geometry to solve arithmetic problems, such as the solution to Fermat’s Last Theorem. Along with colleagues, he has made fundamental contributions to p-adic aspects of arithmetic geometry by transferring ideas from complex numbers to p-adic numbers. BICMR has developed into China’s leading research centre in mathematics, providing a lively and stimulating research environment for international researchers. It has established connections with many world-leading mathematical institutions, and its notable achievements have seen its reputation grow. BICMR is poised to become a top mathematical research institute.